i like the possibility of cap rising for many of the observations you make.. being out of the loop in not living in the uk, or watching tv - it is harder for me to get much of a grip on her personality.. i just read data on the net and play around with concepts like the ones you mention here for seeing the possibility of cap rising.. i guess you noticed me mentioning this on the other theresa may thread here in the mundane forum..
don't understand why a thread on may's birth chart gets put on the mundane forum... may as well put every politicians chart on the mundane forum then... i am saying this to get more clarify on this and the many posts i have made of political characters on the natal astrology forum here at skyscript. The second and third times seem a better fit. The third time gives a strongly melancholic flavour to the chart, with the phlegmatic temperament playing a less strong role. The second time shows a more even balance between phlegmatic and melancholic. The 3:50PM time brings natal Saturn very close to the MC and gives a full eighth house (Alcabitius). It also places Jupiter in Virgo trine ascendant. Retrograde Mercury in the eighth rules the fifth and eighth. Retrograde Mars in the second is the almuten of the MC and ascendant. 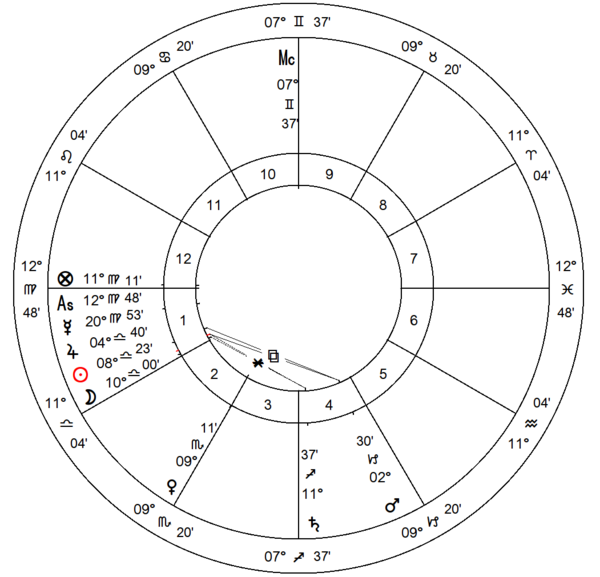 With the Capricorn ascendant at this time, May experienced transit Pluto and the transit Saturn square her ascendant during 1980-1982 from Libra (ninth house - Alcabitius; tenth whole sign house). Did this testing time cause her to question her faith being very difficult ninth house transits. The following chart is cast on the basis of the 3:50PM rectification. 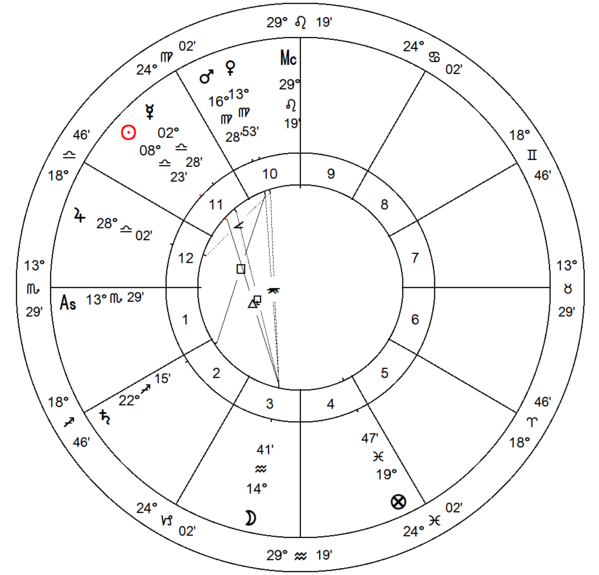 The angular Mars-Jupiter conjunction in Virgo is very powerful, bringing the t-square with Moon and Saturn on the sixth-twelfth axis into play. I would expect a very powerful return like this to be in play during a major period of life change. The Mars-Jupiter conjunction is closely sextile SR ascendant. Note that the SR Mars is very closely conjunct natal Moon in this case. Note SR Sun is precisely square SR ascendant. The long memory,patience, ruthlessness and fearlessness in revenge = Scorpio. The insulter forgets what he / she had said but the Scorpio remembers it and reminds it , very painfully of course. The long memory,patience, ruthlessness and fearlessness in revenge = Scorpio. The insulter forgets what he / she had said but the Scorpio remembers it and reminds it , very painfully of course. Indeed but keep in mind with Capricorn rising we have Saturn in Scorpio as ASC ruler. and what other '''powerful''' women in britian has that set up? lol..
okay, times up! the queen! I do find your rectifications useful, but wanted to post my own chart for Theresa May as I do need the outer planets, and I like to use the Mean Nodes of the Moon, not the "True" ones, and I think these are highly significant in her chart and at the moment powerfully transited. I used a noon chart, just to get an idea of where the Moon could be in her chart, as I feel it might be in Virgo, squaring her Moons Nodes and hence getting strong transits currently. I don't feel she is a Moon conjunct Pluto in 29 degrees Leo person, but she has a deep and thoughtful, introverted trait that I associate with aspects between the Moon and the Moon's Nodes (and some other aspect patterns of the Moon). I think it is qualities of her Virgo Moon in this aspect that I like about her, and I think it could be a significant part of her chart that is being stressed currently. The antiscion of her Neptune is 0 degrees Pisces 40 minutes, so this is part of the pattern with her Moon. Actually, there is another pattern in her chart that is currently being stressed, which focusses on transiting Jupiter in 9 degrees Libra, and the antiscion of transiting Chiron (21 degrees Pisces, antiscion 9 degrees Libra), which hit her natal Sun and everything associated with it, which is very powerful in her chart. Obviously she is having political challenges, but maybe her husband is ill or in difficulty? She isn't a lady who says much about her private life. The Sun can also represent physical health, and maybe she is struggling at the moment, from that transit at the end of October which runs through early November. I have noticed that a simultaneous transit of Chiron and Jupiter seems to block the healing, or harm, that Chiron is trying to open up? Transiting Saturn and Jupiter's antiscion in mid November hitting her natal Jupiter and transiting Mars in 6 degrees Aquarius around 17th November conjunct her natal Chiron suggest that current stresses will ease and turn around favourably for her. She also has natal Lilith in 3.5 degrees Aquarius, so the transit of Mars in Aquarius in mid November over this area should enable her to call on her inner power to fight and succeed. I have been wondering about Theresa May's chart with the general election coming up on Thursday and the polls showing a swing to Labour. This thread reminded me that we don't know her time of birth, so it is impossible trying to guess where her Moon is. I was thinking her Moon was 1.5 degrees Virgo, as in her noon chart. If it was, then it would be a powerful Moon that currently has transiting IsisTranspluto sitting right on it. And natally that Moon would be the opposite of autism, so interesting that she came to a lot of people's notice when she became home secretary and one of the first things she did was lift the extradition threat from an autistic man, which no Labour home secretary had done in over a decade. 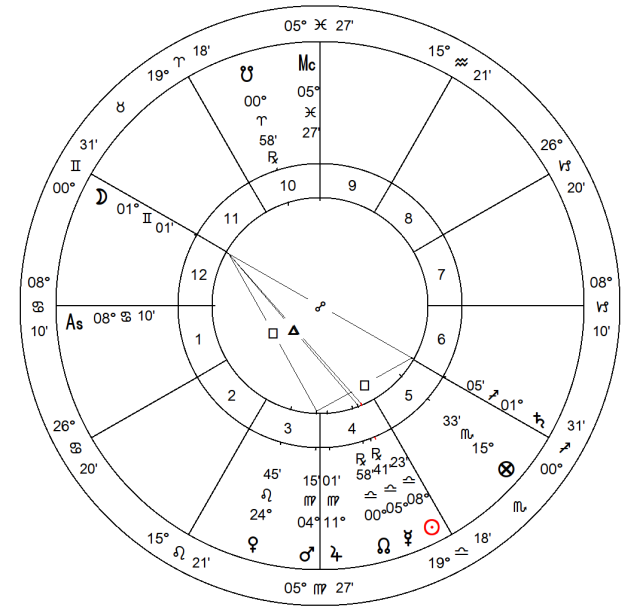 Hi - Theresa May's 2016 Solar Return is posted below, cast on the basis of a rectified time of 3:50PM, Porphyry houses. Mercury, the ascendant and MC ruler rises in the first house, very powerful in its own sign and exaltation. Saturn is on the IC - a wicked cosmic pun on the 'strong and stable' strapline? Interestingly, Mars in May's natal chart falls on the SR descendant. Is this the challenge posed by Jeremy Corbyn, an unlikely contender for the post of Prime Minister, turning the tables on her (and undermining her perceived strength)? The Moon is very new, ruled by a detrimented Venus in Scorpio on the cusp of the third. The Sun and Jupiter are also ruled by this planet. Mars and Mercury are the powerhouse planets both being in exaltation. A nocturnal chart seems very relevant here, with May being accused of 'hiding away' from scrutiny and only appearing in stage-managed events. thanks for doing this.. i looked at the 350pm chart and also a noon chart which has saturn rising... both of them offer a capricorn profection year which puts emphasis on the placement of saturn in the natal and solar return charts..
saturn is very strongly placed in both charts but for different reasons. 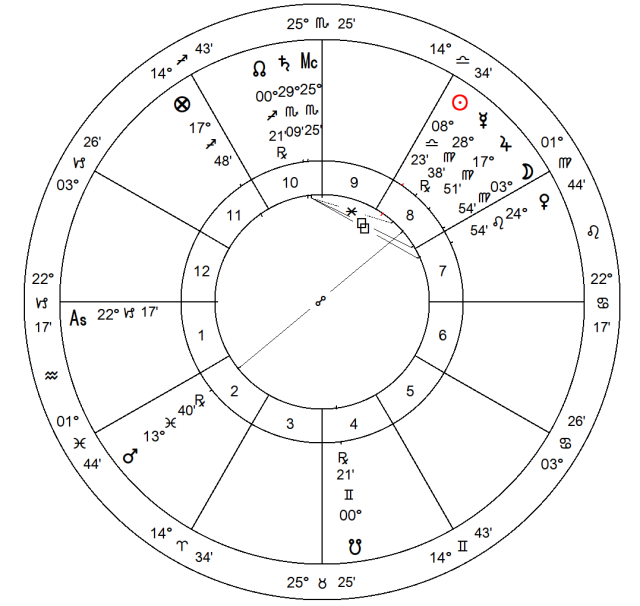 however, the pluto/venus conjunction squares onto saturn which is a tough pattern to work with.. meanwhile the nodal axis highlights the area, by squaring onto saturn, conjunct pluto..
hard to know if either chart is relevant, but fun to consider.. i am not following the election closely, but it seems theresa mays stars have dimmed in the past month or so. i also quickly looked at the solar arc directions.. nothing outstanding to be seen from my quick read.. i am unable to offer an astro prediction off an unconfirmed birth time.. i continue to believe she has saturn prominent in her chart however.. whether it is cap rising, or saturn hitting an angle - hard to know..
Temperamentally, I think May may be more choleric than this time suggests which has made me wonder about a Leo Moon. However, I don't think she has any of the sense of display that would suggest this moon placement (the shoe thing comes from Mars in Pisces surely!). For interest, the 2017 return is posted below. This seems to me to be another interesting and powerful return, with the MC degree being the degree of her natal Pluto (non-trad I know), but SR Mars conjunct her natal Jupiter and opposite it's natal place. This return doesn't really suggest to me that she is going to be out of office any time soon. There are lots of cross chart contacts that suggest a enhancement of her power. However, I could be wrong..! We will know more by Friday morning no doubt. Hi - well, who knows, Theresa May might be out of office today! It seems her 'strong and stable' wish for a huge mandate has been well and truly overturned. You never can tell, can you! i think one of these saturn ruled charts might be working.. i wasn't positive on her election chances here, but i don't like shooting in the dark with speculative charts.. i have done it too often and been wrong, lol! sure would be nice to get a chart for corbyn too while we are at it..
Generates tension Theresa May's cabinet, giving a complicated month, where she can make a change of cabinet, besides difficulties, that can affect her health. I often find people's writing styles hard to read, but Theresa May's words are crystal clear. I don't agree with her about this war, but she makes her case extremely well. Time will tell if she was right about this being limited to destroying a chemical weapons facility, with no civilian casualties. She is well aware that many people think these bombings are about regime change. Smart lady (her Mercury is retrograde, and Mercury goes direct on 6th October 1956 at 27 degrees Virgo 17 minutes, so it is close to a station). The link is to the speech she gave explaining her decision to bomb Syria. Transiting Chiron is exactly opposition Theresa May's natal Mercury as she makes this extremely well articulated decision to bomb Syria. Jeremy Corbyn doesn't seem to be in favour of this bombing of Syria, and many British people would vote for him just on this one issue. At the last general election Corbyn's party got a virtual hung parliament.